"Sampath Speaking" - the thoughts of an Insurer from Thiruvallikkeni: Ramanathan shocks Thiem ~ heard of Antalya ? We may not be reading about this place is located on the Mediterranean coast, between the Taurus Mountains and the Mediterranean sea. It is Antalya ! First something on Wimbledon - The pristine grass courts, the strict all-white dress code and the majesty of the All England Club mean that, for two weeks of the year at least, the eyes of the sporting world fall on a small corner of southwest London. Wimbledon always guarantees high drama as well as high-quality tennis: but this year’s Championships appear to be particularly unpredictable. Both the men’s and women’s singles are exceptionally open, with a large number of players confident of success. Andy Murray beat Milos Raonic 6-4, 7-6, 7-6 in last year’s final, to win Wimbledon for the second time in his career. Twelve months after shutting down his season in the wake of a devastating semi-final defeat, Roger Federer returns to Wimbledon as favourite to capture a record-breaking eighth title and become the tournament’s oldest champion. The evergreen Swiss superstar, who turns 36 in August, has stunned the critics who wrote him off as yesterday’s man when he went down to Milos Raonic in five gruelling sets on Centre Court in 2016. The loss forced him off tour for the remainder of the year to rest a knee injury, leaving his Grand Slam title count on 17 where it had been since 2012. Fast forward a year and Federer is poised to break the tie for seven Wimbledon titles he shares with Pete Sampras and take his career tally at the majors to 19. With eternal rivals Andy Murray and Novak Djokovic in slumps of varying lengths and degrees of seriousness, and Rafael Nadal fretting over whether or not his knees will bear the stress of grass courts, it is Federer in the box seat. Federer, who captured a fifth Australian Open in January, will go into Wimbledon buoyed by a ninth title on the grass of Halle. Belek is a township with own municipality in Serik district in Turkey's Antalya Province. The local population varies between 750 and 10,000 in low and high season, respectively. Belek is one of the centers of Turkey's tourism industry and is as such home to more than thirty four-star and five-star hotels and many other accommodation, services and entertainment facilities. The Kurşunlu Waterfall is a place in Belek. There are over 100 bird species living by this natural wonder. The hidden cave at the back of the waterfall is a popular place for visiting. Near Belek there is the Hellenistic city of Perge, which is rated second after Ephesus and the great amphitheater of Aspendos that still today can hold over 15.000 spectators. It is here that Antalya Open 2017 is held for the first time and on a calm, sunny day in Antalya, Turkey, in front of a sparse crowd, India's Ramkumar Ramanathan pulled off a spectacular upset. The 22-year-old handily defeated the top seed and eight-ranked Dominic Thiem 6-3, 6-2. Ramanathan, ranked 222 in the world currently, came into the event as a qualifier. After winning two qualifying rounds, he defeated Brazil's Rogerio Dutra Silva in the opening round of the Antalya Open for his first top-100 win of the year. 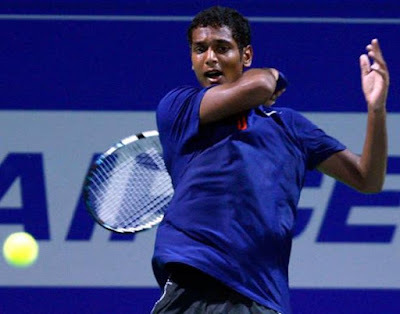 Not only was this tournament his first ATP Tour-level event on grass-court in 2017, the second-round clash against Thiem was also the first time Ramanthan was facing a top-10 player in his career. Antalya Open is played on grass courts and is part of the ATP World Tour 250 series of the 2017 ATP World Tour. Thiem, who won the grass-court Stuttgart Open in 2016, had recently made the semi-finals of the French Open, where he lost to eventual champion Rafael Nadal. The top seed was the heavy favourite in this match, but he could barely survive an hour against Ramanathan's onslaught of big serves and forehands. Ramanathan showed no signs of nerves in the biggest match of his career, and started proceedings with an ace. He confidently held at love and then immediately broke Thiem in the following game for a 2-0 lead. He held on to the advantage all through the first set, sealing it 6-3 with his fifth ace of the match. Ramanathan saved the only break point that Thiem would create in the match while serving at 5-3 with a booming, unbeatable serve. The Chennai boy ended the match with 10 aces and two double faults, and had an impressive first-serve percentage of 63. Out of 31 first-serve points, he lost only three and overall, won 19 more points in the match than Thiem. Ramanathan's win is also a rare chance for Indians to celebrate a win in the men's singles. The last time an Indian defeated a top-10 player was way back in 2014, when Devvarman registered a win over Juan Martin del Potro, then ranked five, at the Dubai Open. However, the Argentine had retired hurt after dropping the first set. Before that, we need to go as far back as 1998 for a victory of a similar magnitude, when Leander Paes got the better of Pete Sampras.